I like to celebrate the first chill of Fall by making a big pot of healthy vegetable soup. For me it’s a way to shore up the body for the onslaught of colds and flus trying to have their way with us from now until spring. I love my immersion blender. They’re relatively cheap and beat the heck out of pureeing foods (especially piping hot foods) in a stand blender or food processor. 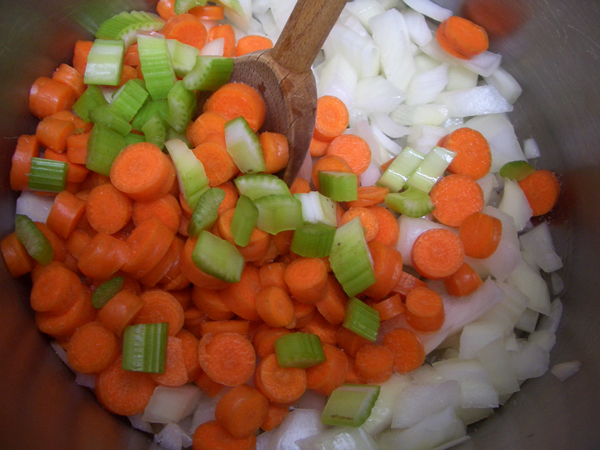 I puree most of my vegetable soups because I think the flavors come together better when you do. But I know people who will only eat chunky soups. Your call. 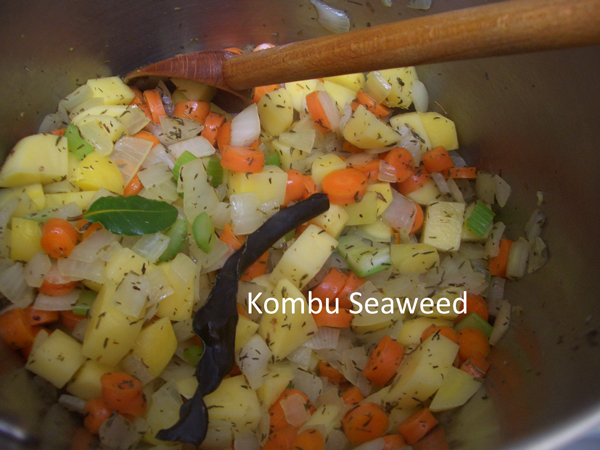 *Kombu seaweed is a type of dried kelp used in a lot of Asian (especially Japanese) dishes. It is highly nutritious and adds a nice flavor, but the reason I use it in most of my vegetable soups is because it aids digestion. Vegetables in great quantity and especially certain types can sometimes make the body feel like a pipe organ, and the Kombu helps run interference. We’ll leave it at that. Though the onion and carrot, for me, are a must for this soup, the other vegetables can be swapped out for what you prefer. I use celery, but not a lot because though I like the flavor, it’s stringy and can overtake the soup when used in abundance. You could swap the potatoes for rutabagas or zucchini or other squash and take the GI down a good deal. You could use spinach or kale instead of chard–I always like to have something dark green in there. If using spinach, reduce the cooking time to 5 instead of 15 minutes. Another vegetable that’s great to toss in the soup after you’ve pureed it, is corn–especially when it’s fresh and super sweet and crunchy. I tend to stay away from peppers, turnips and parsnips for this basic soup because they have very strong flavors that can wind up being the only thing you taste. I had thyme handy so I used thyme. You can use whatever herb appeals most to you. Taragon or sage would be nice. Saute the onions, carrots and celery in a few tablespoons of olive oil and a pinch of salt over medium high heat until the onions are translucent, about 5 minutes. Add the thyme and bay leaf and cook another minute. 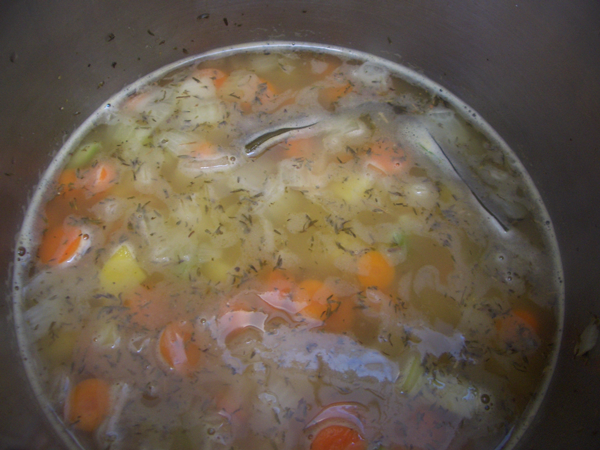 Add the potatoes, Kombu and the stock. Simmer for 30 minutes or until the potatoes are just tender. Add the Swiss chard and cook for another 15 minutes. Using an immersion blender, puree the soup to the consistency you like. I like to leave a little texture. You can either remove the Kombu or puree it into the soup. What starts as a paper-thin curly black strip will evolve into a thick green entity many times its original size. Season with salt and pepper to taste. 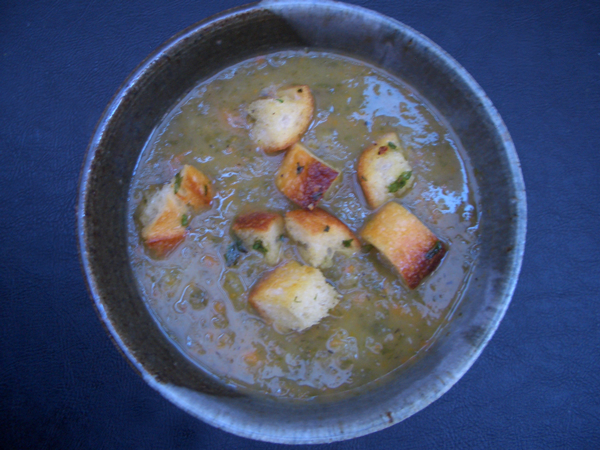 The soup can be made in advance and stored for several days in the refrigerator. This recipe makes way more croutons than you’ll need for 4 bowls of soup, but they can be stored for a few days and used on salads. That said, if you put what’s remaining in a bowl in the middle of the dinner table where people can snack on them, I doubt you’ll have any left over. Preheat the oven to 300F/150C degrees. In a small bowl, mix together the olive oil, butter, garlic and parsley. 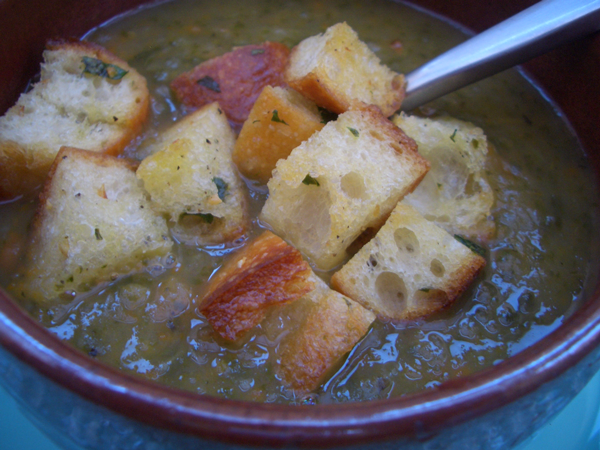 In a large bowl, add the bread cubes and olive oil mixture. Toss together until the bread cubes are evenly coated. Line a baking sheet with foil or parchment paper. Spread the bread cubes evenly across the sheet. Bake for 15 minutes until nicely toasted and golden around the edges. Check every 5 minutes to make sure nothing is burning. 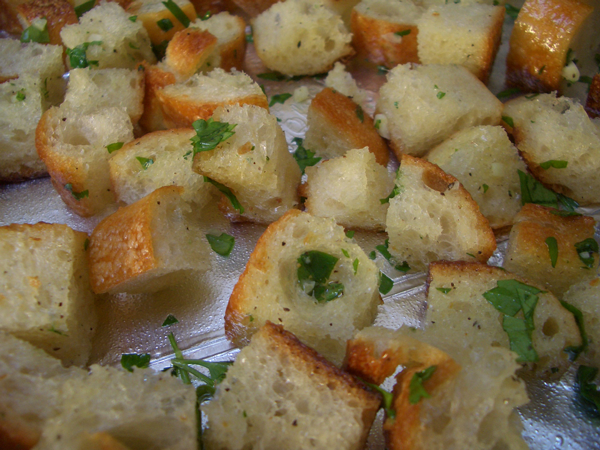 The croutons can be kept in an airtight container for several days.